The magnificence and enchanting colours of the island’s Buddhist temples with their incredibly-large statues are the protagonists of a fascinating journey into Koh Samui’s spirituality which also reserves a fun surprise: trained monkeys that harvest ripe coconuts climbing up the trees! 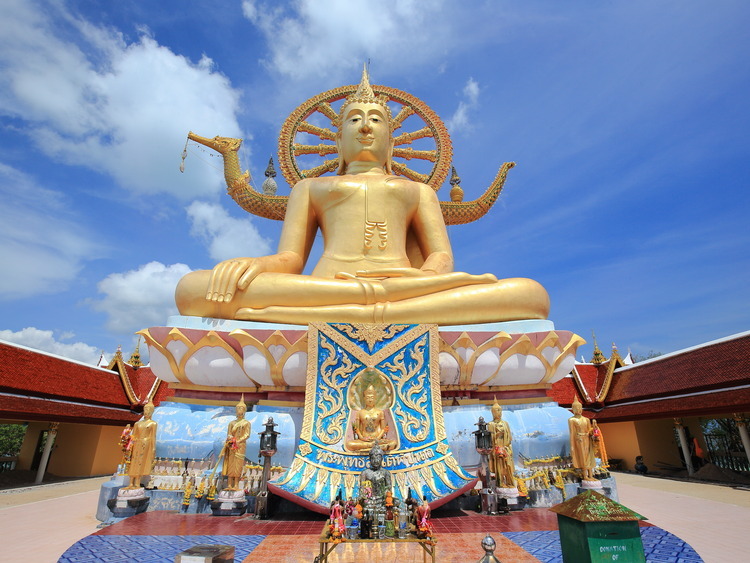 We start our excursion with a visit to Wat Phra Yai, or Big Buddha Temple, located in the northern part of Koh Samui on an islet linked to the main island by a raised road. The Big Buddha Statue was built in 1972 and is 12 metres tall with a splendid backdrop of blue sky and tropical sea. The platform where the statue is located offers breathtaking views over the marvellous beaches and crystal-clear waters. We then visit the majestic temple of Wat Plai Laem, home to the evocative statue of Guanyin, Goddess of mercy and compassion, which appears before our eyes as soon as we pass by the lovely lake populated by small fish. The last stop on our excursion is a coconut tree plantation, where we have the chance to observe monkeys harvesting coconuts by climbing up the trees: it is a tradition typical of the island, which is in fact known as “Coconut Island”. Footwear must be removed and socks must be worn to enter the temples. This excursion involves long walks, it is therefore not recommended for guests with mobility problems. Do not forget to bring insect repellent with you.